Neil Oliver, Chris Packham, Andy Torbet and Dr Shini Somara join archaeologists from around the world who have gathered in Orkney to investigate one of Europe's biggest digs. Orkney - seven miles off the coast of Scotland and cut off by the tumultuous Pentland Firth, the fastest flowing tidal race in Europe, is often viewed as being remote. But recent discoveries there are turning the stone age map of Britain upside down. Rather than an outpost at the edge of the world, recent finds suggest an extraordinary theory - that Orkney was the cultural capital of our ancient world and the origin of the stone circle cult which culminated in Stonehenge. In this three-part series, Neil Oliver, Chris Packham, Andy Torbet and Dr Shini Somara join hundreds of archaeologists from around the world who have gathered there to investigate at one of Europe's biggest digs. Chris Packham uncovers the secrets revealed by the DNA of Orkney's unique vole, Neil Oliver explores Orkney's tombs and monuments, Dr Shini Somara experiments to discover how the Orcadians could have moved giant blocks of stone over rough ground and archaeological adventurer Andy Torbet climbs Orkney's most challenging sea-stack to unlock the story of Orkney's unusual geology. A collection of some of our favourite documentaries exploring Scotland and its people. 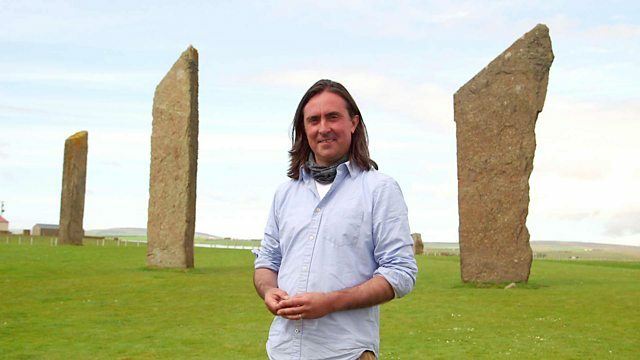 Neil Oliver, Chris Packham, Andy Torbet and Dr Shini Somara explore the secrets of Orkney. Find out about our four fantastic presenters.